Feasibility of Simultaneous Hiatal Hernia (hh) Repair and Laparoscopic Adjustable Gastric Banding (lagb): Case-in-point Presentation for Prevention of Delayed Complications. Introduction. Hiatal hernia discovered during LAGB presents a treatment dilemma. However small should it be repaired or disregarded. The following case report illustrates the extent of delayed morbidity if HH is left unchecked. Methods and Procedures. A 46 year old female with a initial BMI of 34.2 underwent LAGB in an outside hospital two years prior to referral with interval weight loss of 41.6 lbs (EBWL 58.7%). HH was not mentioned in the procedure report. Within a year patient had experienced recurrent pneumonia and severe aspiration pneumonitis. Upper gastrointestinal series demonstrated significant esophageal reflux and a sliding HH as well as dilatation of the proximal gastric pouch despite complete band decompression. During laparoscopic exploration a 5 cm Type I HH with large mediastinal hernia sac and band prolapse into the mediastinum was encountered. Patient underwent LAGB explantation and simultaneous HH repair with Nissen fundoplication. Postoperative period was unremarkable and at 1 year follow-up there was complete resolution of symptoms and no weight regain. 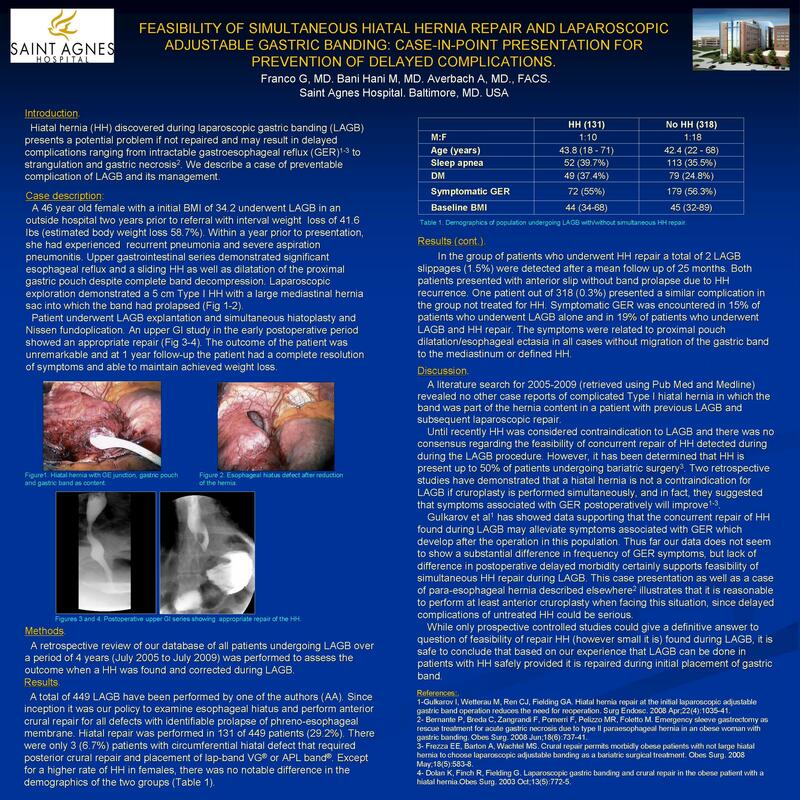 A retrospective analysis of our data over a period of 4 years was performed to assess the outcome when a hiatal hernia was detected and repaired during LAGB. Results. From July 2005 to July 2009, a total of 449 LAGB have been performed by one of the authors (AA). Since inception it was our policy to examine esophageal hiatus and perform anterior crural repair for all defects with identifiable prolapse of phreno-esophageal membrane. Hiatal repair was performed in 131 of 449 patients (29.2%). There were only 3 (6.7%) patients with circumferential hiatal defect that required posterior crural repair and placement of VG or APL band. With mean follow up of 25 months there was a total of 2 anterior LAGB slippages (0.44%) both unrelated to HH. Symptomatic GERD was encountered in 15% of patients who underwent LAGB alone and in 19% of patients who underwent LAGB and HH repair. In all cases symptoms were related to proximal pouch dilatation/esophageal ectasia without gastric band mediastinal migration or defined HH. Conclusion. These data indicate feasibility of Type I HH repair once identified intraoperatively during LAGB thus reducing delayed postoperative morbidity.